How to do fundraising right. Starting now. Uncle Maynard is so good to me. He gave me hundreds of direct-mail fundraising appeals that he'd been gathering. Now I'm studying them. Is your brand a prison? What happens when you send a check to your donors? The future of fundraising is not about social media, online video, or SEM. It's not about any technology, medium, or technique. It's about donors. If you need to raise funds from donors, you need to study them, respect them, and build everything you do around them. And the future? It's already here. More. Jeff Brooks has been serving the nonprofit community for nearly 30 years and blogging about it since 2005. He considers fundraising the most noble of pursuits and hopes you'll join him in that opinion. 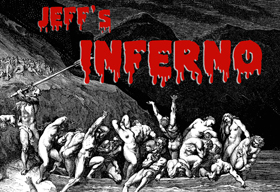 You can reach him at jeff [at] jeff-brooks [dot] com. More. I'm a Fundraisingologist at Moceanic, the company that can help you transform the way you do fundraising through focused, experience-based online courses and one-on-one coaching. Find out what we can do for you and with you! Admit it: Fundraising writing is weird. So many people get thrown into the work of writing fundraising without ever being told about the weird they need to live with -- and master -- if they're going to succeed. How to use rhyme to make your message more memorable and persuasive. How to tell stories that motivate donors to give. How to meet donors' emotional needs. Whether you should use guilt as a motivator. Whether you're working on your very first fundraising writing assignment or you're a seasoned veteran ... whether you want it for yourself or need to show someone else how the pros write fundraising -- or both -- this is a book you should order today. Claire Axelrad on Do you want your donors to give or to donate? Katherine Boyce on How about a money-back guarantee for donors? Raise funds with your eyes open. Skip the guesswork. Show your boss what really works. 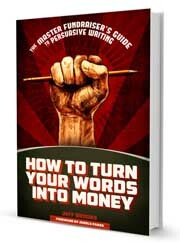 This book takes you on a fact-filled and memorable journey through writing, design, strategy, and the mental game of effective fundraising. Proven, tested, real-life techniques that give donors what they want so they can make the donations you need. If you care about fundraising, about your donors, and about supporting your cause, you need The Fundraiser's Guide to Irresistible Communications by Jeff Brooks. Order it today from Amazon. Discover how to make branding improve your fundraising in The Money-Raising Nonprofit Brand: Motivating Donors to Give, Give Happily, and Keep on Giving. It's easier -- and less expensive -- than you may think! 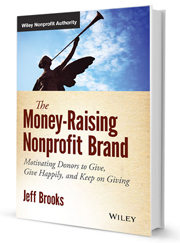 If your organization is even vaguely considering "branding work," you need to read The Money-Raising Nonprofit Brand by Jeff Brooks. Read more here.